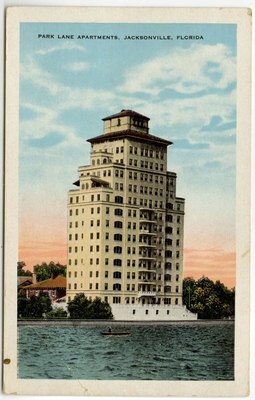 "Park Lane Apartments, Jacksonville, Florida. Circa 1920-1950"
On the back: Jacksonville as a place of winter residence offers many unusual advantages to people from the north. Florida's winter climate is world famous. The summer climate in Jacksonville is equally enjoyable. Neither business nor recreation is equally enjoyable. Neither business nor recreation is interrupted by heat during the summer. Here we have almost none of those excessively humid, sultry, summer days, so common to cities further north.